Dubai's buoyant hospitality sector, which is gearing up to host more than 20 million visitors at World Expo 2020, is way ahead of seven other key global cities in average spend per overnight visitor as well as in the number of hotel keys per resident. Dubai leads in total number of hotel keys per resident at 29.9 per 1,000 people when benchmarked against international hub cities. Paris is the next highest with 17.6 keys per 1,000 people, Knight Frank said in its Hub Report. Dubai also stands out in terms of average spend per overnight visitor, which is estimated to be over $2,000 in 2017, the highest among global hub cities. The seven other key global cities chosen for benchmarking include New York, London, Paris, Singapore, Hong Kong, Shanghai and Sydney. "Despite facing challenging market conditions, Dubai's hospitality sector remains among the top performers in the Middle East, underpinned by the emirate's positioning as a regional commerce hub and the development of world class demand generators," said Ali Manzoor, associate partner, head of Hospitality at Knight Frank. According to data from Dubai Corporation of Tourism & Commerce Marketing (Dubai Tourism), the emirate is home to 104 five star-hotels. Overall, Dubai hotel room supply is set to reach 132,000 by the end of 2019, Dubai Tourism said as it forecast that the hospitality sector to experience strong, sustained growth over the coming years, with occupied room nights set to reach 35.5 million annually in 2019, representing a 10.2 per cent compound annual growth rate over the next 24 months. 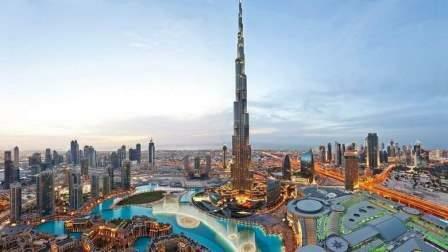 STR global has reported that Dubai has 53 five-star hotels in planning or construction with opening dates before 2020. Helal Saeed Almarri, director-general of Dubai Tourism, has said with international and local investors, and operators continuing to actively pursue opportunities in Dubai. Dubai expects to see not only sustained growth in inventory in line with the projected demand for occupied nights, but also further diversification across various asset classifications. Manzoor said visitation has continued to grow from key source markets, with India and China notable standouts, and Russian visitation continuing its positive momentum from the previous year. We remain optimistic about the future outlook of the sector, and envisage that the market will once again stabilise once the rate correction has run its course," said Manzoor. VA Hassan, chairman and CEO of Flora Hotels Group, said the outlook for Dubai's vibrant hospitality industry has never been so bright. "An exponential growth in Dubai's world class tourist attractions including Dubai Safari, a host of new theme parks and resorts will remain irresistible for holidaymakers and visitors on the back of the city's excellent air connectivity, superb amenities and infrastructure," said Hassan, whose Flora group has already launched a Dh1 billion expansion drive. Knight Frank's report said Dubai International Airport, the world's largest airport by international traffic, recorded 83.7 million passengers in 2016, up 26 per cent from 2014. In 2017 this has increased further to over 88 million passengers. According to the report, it is estimated that the hospitality sector contributed over Dh150 billion to GDP (4.6 per cent of GDP), and provided almost 570,000 jobs (4.8 per cent of total employment). The sector's direct contribution to GDP has increased by 138 per cent in the 10 years to 2017 with employment in the sector growing by 119 per cent over the same period. The report said a prime facilitator of Dubai's remarkable growth in tourism is the Emirates airline, now serves over 150 destinations on six continents with a modern fleet of 259 wide-body aircraft, with orders of 76 additional aircraft placed in 2017 alone. Dubai's status as a global hub will only continue to strengthen given its extensive connectivity, strong economic prospects, low tax system and safe haven status all underpinned by world-class amenities and infrastructure, Knight Franck said. In November, STR released a report which noted that the supply of hotel rooms in Dubai will significant increase, as the emirate currently has 29,226 hotel rooms in 95 projects in various stages of planning - the largest construction pipeline in the Middle East.